A great way to add color contrast to the garden! 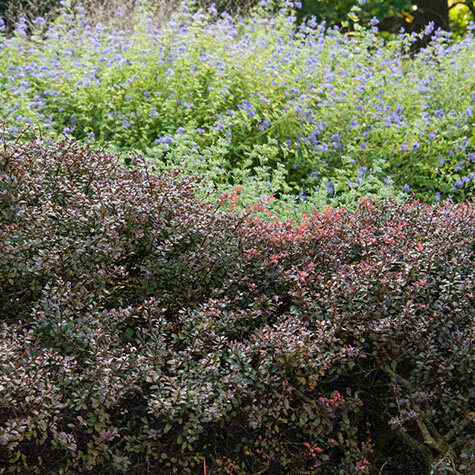 This compact shrub has crimson foliage so it's a good companion to perennials and shrubs that have green foliage. Growing 18-24 in. tall with a 30-36 in. 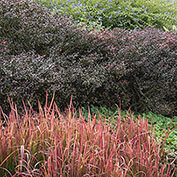 spread, this easy-to-grow, deciduous shrub is a good choice for planting in borders, naturalized areas and rock gardens. Grows best when planted in full sun. Deer tend to avoid. 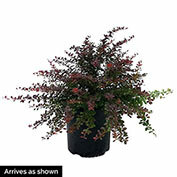 Crimson Pygmy Dwarf Barberry is available in a gallon pot and shipping now. Potted. Zones 4-8. Foliage: Deep crimson, deciduous foliage. Branches have thorns. Soil Requirements: Well-drained, average garden soil. Avoid wet areas. Pruning: Prune in winter to maintain desired shape. Comments: Attractive, dark crimson foliage is the perfect contrast to green or gold foliage in the landscape. 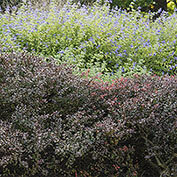 Use in the border or as a low hedge.